Last Saturday was a very special day as HG Madhavananda Prabhuji, along with his kindhearted wife KrishnaKunda Mataji, purified our home. Prabhuji stayed only for day but he enlightened all of us with his deep insights into Krishna consciousness. During the discussions at home Prabhuji asked do I know why do we offer chappan bhoga (56 dishes) to Krishna ? I replied in negative. After a while Prabhuji searched and came back to share the mystery of offering chappan bhoga to Lord. So they made fifty-six different things for Lord Krishna and offered Him as a token of their love and gratitude. Thus began the tradition of offering “Chhappan Bhog” to Supreme Lord on festive occasions. All glories to Govardhan Lila! Although Prabhuji was very tired, his next day was a hectic same day return trip to Vrindavan, yet he agreed to our request to visit the deity installation ceremony at the home of Shyamvihari prabhuji. We entered the packed home of Shyamvihari Prabhuji, everyone was dancing to the kirtan by HG Sriniket prabhuji. We took darshan of very beautiful Nitai Gaura Sundar. Madhavananda Prabhuji spoke very briefly, less than 30 minutes, but Prabhuji mesmerised everyone with his deep thought process and made everyone think too. I am sharing some nectar. Prabhuji first sang a beautiful bhajan by an anonymous vaishanava called Krishna Das. I request readers to kindly read it carefully and absorb the English translation of each para carefully as the whole session was based on it and these lines will get quoted again. I pray that Lord Nityananda will not look at my sins, I did not worship the Lord’s lotus feet. Alas! I did not know. What a demon I was. I did not worship Lord Nitai, the Lord of mercy. O my unfortunate heart! Will you ever become happy? Why do you not call out, “Nitai!”, and die. When they hear of Lord Nitai’s mercy, even the stones melt. O my cruel heart, you do not melt when you hear His glories. To persons who do not offend Lord Chaitanya, Lord Nitai gives the gift of spiritual love and devotion. Alas! The Lord’s holy name does not rest on my throat or in my heart. Krishna Das says: I am very unfortunate. I offer my respectul obeisances unto Sri Krishna Caitanya and Lord Nityananda, who are like the sun and moon. They have arisen simultaneously on the horizon of Gauda to dissipate the darkness of ignorance and thus wonderfully bestow benediction upon all. Prabhuji explained that Gaur Nitai have arisen simultaneously and it is difficult to say who among Them is the Sun and who is the moon. Sun and moon are very auspicious and hence whatever auspicious qualities are there in Sun and moon are there in Gaura Nitai. Prabhuji mentioned that sun drives away all darkness but Gaura Nitai drives away darkness even from those parts which are sheltered from the sun. If we are sitting in a closed room, with all doors and windows locked, then no sunshine can enter that room but if someone gets mercy of Gaura Nityananada then even the dark cave of our heart become illuminated! The Sun also purifies everything, even the most contaminated things like urine and stool too get purified under the sun. Similarly we also hide the most contaminated things in our heart which are comparable to urine and stool. The sun can not purify things in our heart because sun can not see them but the mercy of Gaura Nityananada can purify all the contamination in our heart! Similarly moon helps things grow and in the same way Gaura Nitai help our bhakti creeper, `bhakti lata beeja’, to grow and it is very very cooling, it helps extinguish the fire of this materialistic life. Lord Nityananda never discriminates whether one is uttama or adhama, most elevated or most degraded. Gaur Nitai do not see any designations, who is an Indian, who is an western, who is a brahmin, who is a mallecha. They give Their mercy to every one. And this is really Sri Caitanya Mahaprabhu’s mercy, this is really Mahaprabhu’s movement and this is what we want! Our purpose is not to just make their deity and worship them, our purpose is that we want Sri Chaitanya Mahaprabhu and Sri Nityananda Prabhu to appear in our hearts! So are we getting that ?? 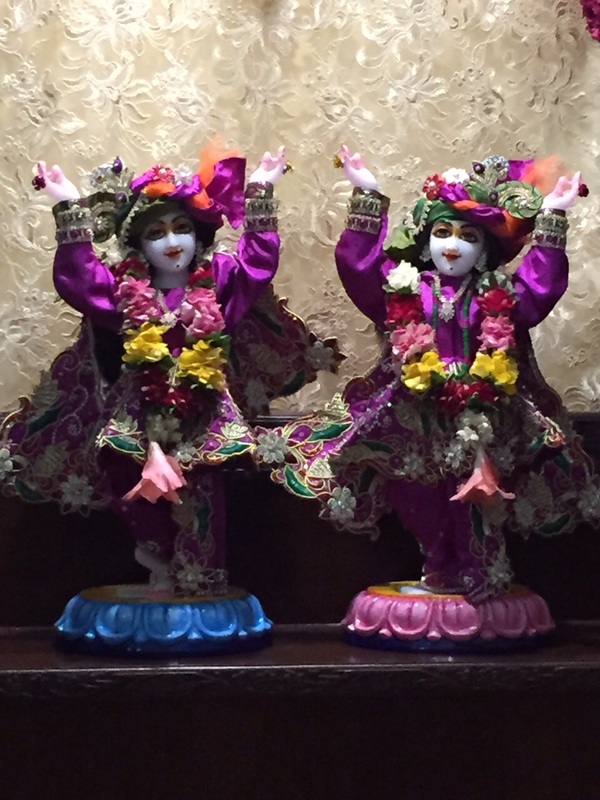 Gaura Nitai gave everyone Krishna Prema ! Prabhuji then asked the devotees to raise their hands who among them has received Krishna Prema ! When no one raised their hand then Prabhuji pushed devotees to think why are we not receiving it ? Madhavananda Prabhuji quoted from the same bhajan to say that Nityananda Prabhu is my Lord. Why ? Because He is adosha-darshi, He doesn’t see any faults and that is exactly what I want because I am full of faults. Śrī Caitanya Mahāprabhu continued, “Within your heart you should keep yourself very faithful, but externally you may behave like an ordinary man. Thus Kṛṣṇa will soon be very pleased and deliver you from the clutches of māyā. Prabhuji said that by following how Mahaprabhu is suggesting, by living our lives as per our whatever be our position in the society, while internally remaining oblivious to them, then we can really chant the name of Nityananda and Gaura! nitä-ira karuëä çuni päñäëa miläya..häya re daruëa hiyä nä darabe täya..
My heart, harder than a stone, it won’t melt ! I am so unfortunate. Why won’t it melt ? What am I doing wrong ? They give nija prema bhakti, They give Krishna Prema. So what I am doing wrong ? Madhavananda Prabhuji then asked how do we worship Surya Deva ? By showing a burning Ghee wick. Similarly how we worship Ganga Devi, by offering her Ganga water. 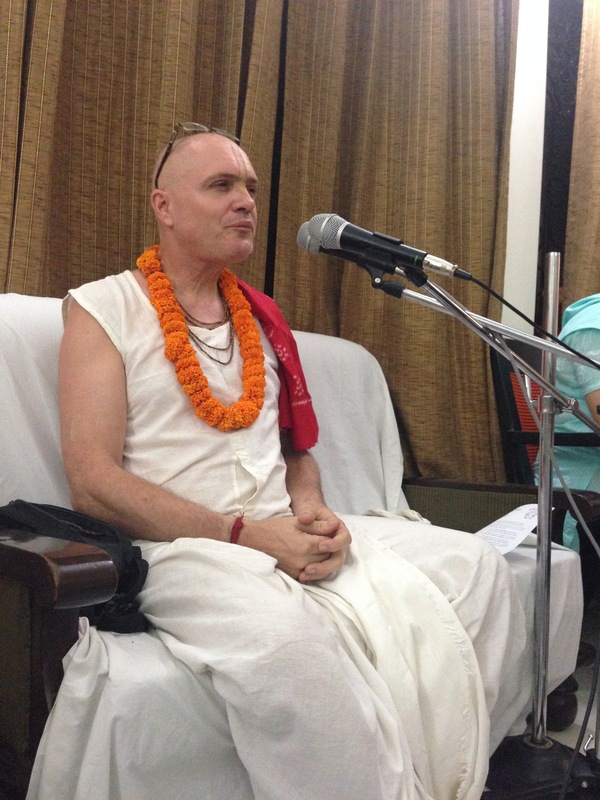 So how should we worship adosha-darshi Nityananda ? Prabhuji then stated strongly that this is what the author of this bhajan is saying that I am not worshiping Nityananda Prabhu, because worshiping Nitai means that I do not find fault in others!! Prabhuji quoted Srila Prabhupada who wrote in his purport to cc Adi8.62 `It is a qualification of a Vaishnava that he is adoṣa-darśī: he never sees others’ faults‘. Prabhuji said that on this day we should think why Gaura Nitai have not entered our hearts yet ? Why is that this ecstasy of love of God is not touching me ? Because I am not really worshiping Them! I am doing something external. I am waving some incense, I am ringing the bell, I am offering some prayers. Prabhuji said this is fine, that is all very pious, but that is not why Gaura Nitai came. They came, like the sun and the moon, to dissipate the darkness of ignorance of this world. First of all we have to open our heart to Them. And we do that by giving up the propensity to criticise or fault find in other people. Prabhuji said that if we are busy with finding faults in others then we are not worshiping Nityananda. Rather we are working for Chitragupta (assistant of Yamaraja, who keeps the account of everyone’s mistakes and sinful activities). To work in the court of Nityananda Prabhu means we must give up fault-finding and the propensity for bearing grudges. Prabhuji said that in our lives we all have a choice, a decision to be made — which court do we want to work for? Do we want to assist Citragupta by being a pāpagaṇanām, a counter of everyone’s faults in the court of Yamaraja? Or do we want to give up finding others shortcomings and work in the court of Lord Nityananda? Prabhuji spoke something very interesting on the Kripa Shakti of the Lord, which I will write later. All glories to HG Madhavananda Prabhuji. 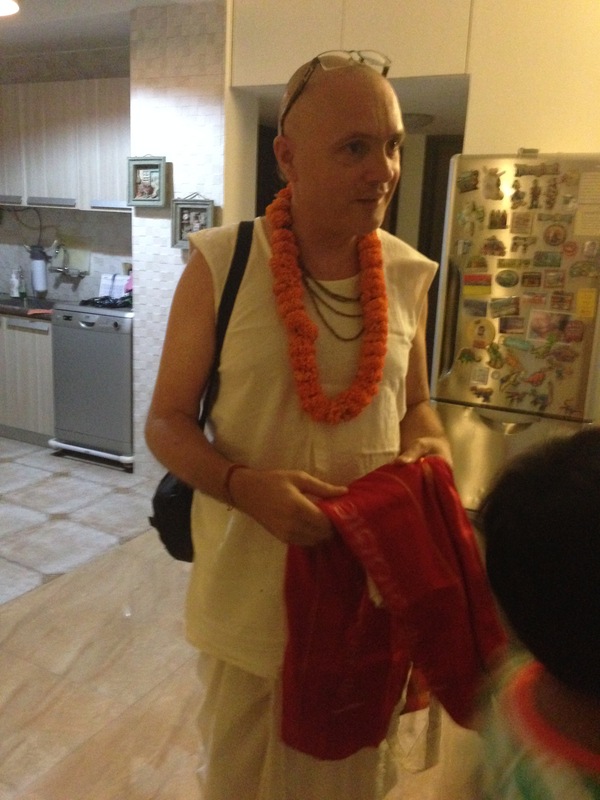 This entry was posted in ISKCON, Mahaprabhu, My spiritual Journey, Q&A and tagged adosha-darshi, chappan bhoga, fault finding, Gaura Nitai, govardhan lila, Krishna Prema, Madhavanada Prabhuji, MahaPrabhu, most degraded, Nityananada, Radha Krishna, Sriniket Prabhu, worshiping deities, Yamaraj. Bookmark the permalink. ← Why is a Jiva called Prabhu ? Hare Krishna Prabhuji, danadavat pranam. AGTSP. PAMHO. This is pure nectar prabhuji….Adosa-Darshi…..what a wonderful way to teach fallen souls like me a lesson..All glories to Madhvanand Pr. Bhagavan Nityananda Prabhu who is none other than Bhagavan Baladeva & Lord Mula Sankarshana walked this earth in tandem with Bhagavan Chaitanya Maha Prabhu to deliver all the fallen souls. While departing from here they look back with a feeling of mission accomplishment. Bhagavan Nityananda Prabhu’s actual mission as Bhagavan Anantha or Sankarshana is to dissolve the material creations ( SB 5.25.6) . But seeing the situation He restrains His anger & intolerance. Now while delusion is being driven to enhanced levels of contamination, He is here as the “”Internet”” bringing the entire knowledge base of the entire Scriptural Cloud to one and all to their personal devises any time anywhere on demand. What an Amazing Lord He is !!!!! Thine will be done by His kind Divine Grace and Powerful Blessings. Allglories to Srila Prabhupada and Srila Gurudeva. It was a real nectar and really an eye opening message to become ‘adosh-dasrshi’ to worship Lord Nityanand in real term.. All glories to HG Madhavanand prabhu.. Thank you very much prabhuji for sharing the nectar.